It's spring time in Wisconsin, which means I am getting outdoors more. Some of you may know this, but I am an avid hunter and fisherwoman. This nice spring weather always sets in my cabin fever, and I can't wait to get out on the lake fishing and watching the wildlife. 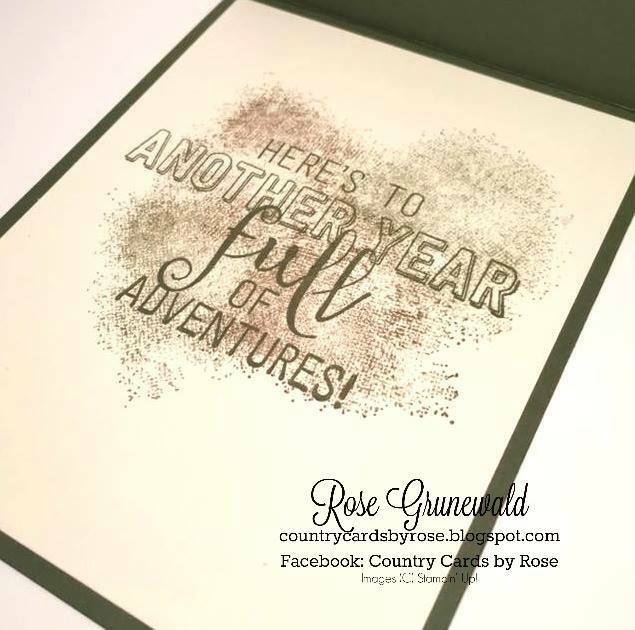 This is exactly what I was dreaming about when I made this outdoorsy card! 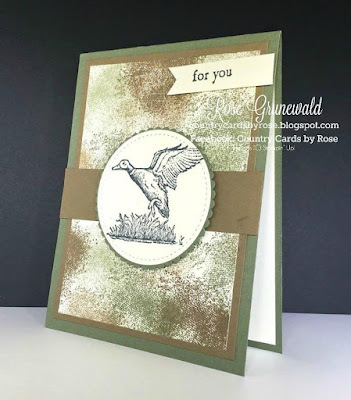 Using the large texture stamp from the Touches of Texture set, in Always Artichoke ink, stamp off on scrap paper first, then stamp sporadically over the Very Vanilla card front. Repeat with Soft Suede. Fill in as needed with both colors without stamping off to get a darker color. This will create your “camouflage” card front. Using the Big Shot Die cut machine, cut the stitched circle out of Very Vanilla, and a scalloped circle out of Always Artichoke. Stamp the duck image in basic black onto the Very Vanilla stitched circle. Adhere the stitched circle to the scalloped circle using liquid glue. Adhere the camouflage card front to the Soft Suede layer and adhere layers to the Always Artichoke card base. Adhere the soft suede strip to the card front layers. Using dimensionals, adhere the scalloped and stitched circle layers to the card front. Stamp the “for you” sentiment from The Wilderness Awaits stamp set onto a scrap of Very Vanilla. Cut edge into a banner and adhere to card front using dimensionals. Repeat camouflage color process from step 1 to the Very Vanilla inside piece. Skip the full strength stamping and stamp off for all 4 texture images. Stamp “adventures” sentiment in Always Artichoke over the camouflage created in the step above. Adhere the Very Vanilla stamped layer to the inside of the card. This card is perfect for the avid outdoors person in your life! Make sure you snag The Wilderness Awaits stamp set because it's retiring! Get yours before it's gone - seriously! This set is a "must have" in my stash. The sentiment on the inside comes from the Balloon Adventures set which is also retiring, and that saying can be used for so many occasions! If you would like to snag any of the products used to make this card, I would LOVE it if you would purchase from me. I truly appreciate your support, and that's how I can keep bringing you all these great projects. I want my customers to feel appreciated, so when you buy from me, you'll be invited to my private VIP page where I get to inspire you with exclusive content, games, and prizes! If you use my monthly hostess code 93X9GTP4, then you'll receive an additional special gift from me.